My original flight was supposed to take place exactly a month ago. However it didn't take place due to the volcano eruption that caused disruptions to the airports near to it. Since the aircraft was in Surabaya at that morning, it was grounded and the rest of the flights that it was scheduled to fly on, were cancelled. That's a bad thing especially when the airline had no spare plane. This airline started off with 2 Beechcraft B200C in early 1991 and then added 2 Bell 412SP Helicopters at the end of the same year. After that, the fleet has grown gradually and now it operates a fleet of 22 consisting of 7 ATR42-300, 3 ATR72-300, 1 Boeing 737-400, 1 Boeing 737-200, 4 Boeing 737-300F, 1 DHC-4 and 3 DHC-6. This airline has a relatively safe record. Only 2 accidents so far in its history. One with an engine failure and the other was due to being shot at by gunmen. How did this interest come about? I was told by my friend about this airline that this was the only one of the two left operating the Boeing 737-200. I did a bit of checking, I realised that (at that time) it was still operating the Boeing 737-200 on Jakarta to Pangkalun Bun (PKN) so I decided to book myself on this flight to fly on this type which was still missing from my flight logbook. Luckily for me, Kal Star has a suitable timing for my return flight otherwise I would have to spent a night at Pangkalun Bun. Not a bad idea, actually. Booking with this airline requires to use one of the local agencies as the airline only accepts local payment. I chose ticketindonesia.info to help me purchase the ticket. Booking with this agency is easy. All you have to do is to send them the flights and dates you are interested in. They will help you book the ticket with the airline and once that is confirmed, you pay your ticket including their booking fees and you are ready to fly with the airline. I paid about S$80 for this one-way ticket. Not very cheap for this 1 hour domestic flight but because very few operators fly on this route so that's why the price is expensive. This was my original booking. TicketIndonesia was the one who informed me about the cancellation of this flight and the nice lady, Anna helped me changed the flight to 15th March. I wanted to do it now then to wait until later on. At that time, I thought the flight was operated by 737-200 so I decided to postpone it a month later as I had to work during the interval. On this trip, I decided to do something different, fly out from Batam a day before to Jakarta. Took the ferry from Tanah Merah to Nongsa by Ferry and from there, I overpaid for the taxi which took me to the Airport. I flew my 55th airline, Citilink to Jakarta. More of this coming up on my next trip report. In the evening at the hotel , I kept checking my email hoping that I won't received the same email (cancellation) and luckily enough, nothing happened and in the morning itself, it was all good. I took the airport shuttle at 7 am to the airport. By the time I reached there, the check-in counter was opened and the staff confirmed with me the flight was operated by a Boeing 737-400. 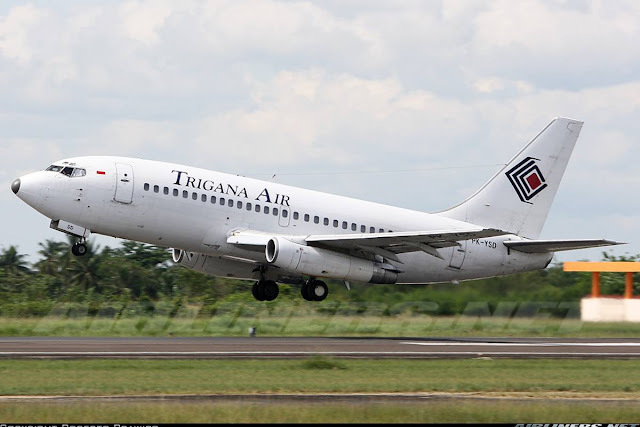 The only flight of the day for Trigana Air. The queue was reasonably long but it didn't take long to get myself check-in. Do note that this airline doesn't offer online check-in and ticket excludes the airport tax. You have to pay the 40000 rupiah at the airport tax counter located before the domestic departure hall. Going through the domestic departure hall. This was where my plane was schedule to depart from even though the check-in counter staff told me C3. Monitor screen was telling me otherwise, so which one should I believe? Why is the screen giving me the wrong information? This aircraft, PK-GLA flew me from BTH to CGK a day earlier! I ended up asking the staff who told me that C3 was the correct gate. The departure time was 0905 and this time came and passed, no news about the departure time as the aircraft was no where to be seen. Flightradar24 doesn't track this airline so I had no idea about the aircraft's location. To make it worse, the information about this airline disappeared from the monitor screen leaving me slightly panic. The Citilink staff who were the only one at the counter told me to just wait for a while more and soon enough, at around 0930. The aircraft was spotted taxiing in and it was indeed the Boeing 737-400. The big question is why wasn't there any announcement of its late arrival to keep the passengers informed? When the announcement was made for boarding, it was only in Indonesian language. Very unimpressed so far, that's not how things should work. As I have a return flight with Kal Star Aviation later on, I cannot afford to miss that flight as that was the only flight left for that day. Miss that means I have to probably spend a night over there and I can't do that since my flight back to Singapore the next day was at 0900 hrs. My mission was to fly on this beauty, the Boeing 737-200! Looks like I have return to Indonesia to try my luck for the airline's Boeing 737-200! I should have flown on Sriwijaya's when this airline was operating plenty of them in the early 2000s. Photographing planes at the air side of the domestic terminal at Terminal 1C was difficult, I had to squeeze my lens between the panels to able to take photos of the aircraft. Not photography friendly at all. Fortunately for me, boarding took place about 10 minutes later. It was pretty messy and no one was there to organise the queue, everyone just rushed forward. Anyway, the load of this flight ended up to be just over 60%. I requested a window seat near the rear but somehow I was assigned to sit with someone who was at the aisle while the rest of the seats in front and back of me were empty. So I moved a few rows in front and then started taking photos. On board the aircraft, no apology or explanation for the delay from the flight crew. Just a rough update about the flight planning. The cabin crew looked very disinterested even though this was their first duty of the day. You would have expected some sort of service. Most of the time during the flight, you could hear them chatting loudly at the gallery behind. I think this flight experience is enough to make me stay away from this airline. If it wasn't the fact that the operator was still flying the Boeing 737-200, I would definitely stay away from this airline. Here are some cabin photos! The seat pitch is quite tight. Do take note this is an ex-Batavia cabin. The seats were fairly comfortable, tight legroom space but luckily for me, no one else was sitting beside me (after shifting to the front). The cabin was clean, everything looks intact. The seats look a bit tired but nothing to complain about. Somehow I wished at that point, the aircraft was a 737-200 instead. I had flown on the 737-400 with Malaysian Airlines and dislike this aircraft type. Along with the -300, I always find these 2 models to be uncomfortable to fly on especially in bad weather. Once the aircraft was pushed back, we taxied to the runway for a quick take off to PKN. The flight was quite bumpy but nothing too bad. I took the time when the seat belt signs were off to snap more photos. The crew were preoccupied with their staff and they did noticed me paying a bit of attention with the cabin but were pretty cool about it. Midway through the flight, the crew turned up with snack box for all of us. I thought they had forgotten all about us! Not bad for this airline. The cakes were tasty and this was one of the few positive aspects about this flight. Once the crew cleared the boxes and did the landing checks (at least they bother to), they were at the rear chatting away till the aircraft reached its parking lot. Landing at PKN was quite bumpy as it was raining at that time. Prior to that, I had not seen rain for quite a while as Singapore at that time was having a dry spell for more than a couple of weeks. So when I got off the plane, it was slightly cooler than usual. PKN airport is very small, there is only 2 parking lots in the tarmac. At that time, there wasn't any planes as the traffic to this airport had very little traffic. At this time of writing this trip report, Trigana Air was operating the ATR-72 and Boeing 737-400 while Kal Star Aviation operated the Boeing 737-500 to this airport. Got off the aircraft from the stair case and made my way to the arrival hall which took less than 3 minutes to exit the airport. More photos of PKN Airport in my next trip report along with my return flight with Kal Star Aviation. There are lot of basics the airline needs to work on and one of them is basic courtesy. If there is a flight delay or anything, please update your passengers. Its not right to keep them waiting especially you know you are just one of the two operators flying on this route. Also if you are at the airport, don't trust the monitor screen. The fact that it shows the wrong information and not up to date tells you everything about it. Would I recommend this airline to anyone? Well, a straight no. You are better off flying with a more reliable airline. How about Kal Star? Do check out my trip report on that one. The cabin crew were certainly not the worst, they were neither rude or friendly, just there to do their job. When they were having their own conversation, they should have just lowered their voices and be professional about it even if the rear is almost empty. Another problem is I emailed the airline regarding some information I wanted to know but no reply from them, that was another disappointment. Anyway for my next trip back to Indonesia, I will be trying my luck again for Trigana's Boeing 737-200. As this is one of the few operators operating this type, I would like to fly on that beauty before it disappears from the sky forever. Thank you for reading this trip report! I haven't flown on the -200 and yes, it has unique engine which the thrust reversal is different! Wanted to fly on the airline's -200 but got the -400 instead. Glad you enjoyed your experience.